legendary Alan Dawson, is the drummer on the album, and Alan pronounced this his favorite among all the albums on which he was recorded. The album’s playlist speaks to Woods’s breadth of interest, drawing from the Great American Songbook, the Brazilian repertoire, and the music of Sonny Rollins, Wayne Shorter and Michel Legrand, as well as including a couple of Phil Woods originals. 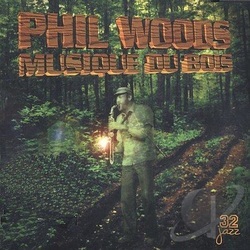 Musique du Bois belongs in the collection of every Phil Woods fan. Actually, it belongs in the collection of every jazz fan.